We look after a number of public and private sector clients in the greater Bristol area and also carry out work on behalf of national Facilities Management (FM) companies. We cover an area of about 50 miles around our base at Junction 18 of the M5, so can easily attend to faults in Bristol, Cardiff, Gloucester, Bath, Swindon and Taunton. We can carry out regular, planned maintenance and urgent, reactive callouts. We aim to carry out callouts on the same day, but, if this isn't possible due to existing work, we’ll always tell you when you call. We are members of the Automatic Door Suppliers Association (ADSA). All our work fully complies with the British and European Safety Standards BS7036 and EN16005, the codes of practice for the safety of powered doors for pedestrian use. We are also highly experienced in the repair and servicing of aluminium and timber manual doors. Please call us on 0117 982 6288. We just wanted to say a big thank you from Bristol and Oxford LIFT. Since bringing Avon Armour on board, you have been brilliant. Servicing has been much easier, through your brilliant communication, and you have helped us shut a number of call outs where other contractors have failed. BS7036 Accreditation. Avon Armour Ltd has been officially recognised by the Automatic Door Suppliers Association (ADSA), as our engineers have passed the industry exams. 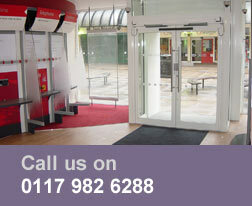 The BS7036 is the code of practice for the safety of powered doors for pedestrian use.